From the bottom of the bottle in yellow print: "VAS19HW 08:09 PKG 26SEP18"
The label I have says: "ALC. 12% BY VOLUME"
Appearance: It pours black with a thick light khaki head with good retention. Aroma: There is a clear oak aroma to the beer with hints of vanilla and chocolate. As the nose pulls back it takes on a classic bourbon aroma. 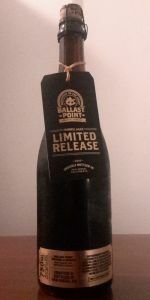 Taste: It has a fantastic flavor of chocolate and bourbon with light undertones of vanilla and wood. Mouthfeel: It feels a bit lighter or thinner than other Imperial Porters. Otherwise it has good carbonation and it is easy to drink for such a high alcohol volume. Overall: It's an outstanding beer. The label does say that this is made with "COFFEE AND VANILLA FLAVORS AGED IN HIGH WEST BOURBON AND RYE BARRELS" but the coffee character doesn't really come through. This doesn't matter too much though because it has a very lovely wood character and the beer as a whole works nicely. It's the kind of beer that makes you want to drink another. I would recommend it and I would buy it again. It's really good, but in a side-by-side with the regular, I preferred the regular. The barrel flavors are there, yet I have had other BA beers that have better Barrel flavors (Just a couple of weeks ago I had New Holland's Dragon's Milk, and I was more impressed with that than with this BA Victory at Sea). pours jet black. The smell is very complex -- roasted malts; chocolate, coffee, vanilla & bourbon. The taste is an amazing balancing act of all those smells. Love the vanilla. The feel is quite smooth. A porter I had only imagined - it is my new favorite "beer." Black in color and impenetrable to light. There's a fingernail of brown covering all but a dime of the top. A massively complex aroma of sweet vanilla, bourbon, and coffee greet my nose. The taste is decadent vanilla, coffee and sweet bourbon along with milk chocolate. The mouth is viscous and silky smooth. Rich, dark color with a short head, the creamy chocolate hazlenut taste fades into a roasted caramel/chocolate taste. Excellent mouthfeel, scent does not match taste. a: Opaque black with a two inch thick tan head which receded slowly to densel lacing and thick even surface foam remaining. s: Dark chocolate roasty malt. t: Follows the nose more definitely along with some alcohol notes and moderate bitterness accompanying a sweet to bitter finish. m; Medium, good body and carbonation tingle. o; A surprisingly chocolaty-tasting porter with that flavor muting the barrel aging somewhat for awhile, but overall a delicious brew with a well-covered high octane ABV. Very interesting and compex throughout. The wood and whiskey give the chocolate and coffee and molasses some real backbone. The aftertaste is a treat. Well hopped early, which provides a layering balance. Chunky and thick in the mouth, yet with a velvety richness. Really exquisite there. Big booze number but absolutely delicious. Poured from 12 oz bottle into a tulip glass. Pours dark with more head than I'm used to seeing with the high ABV barrel-aged beers, which is a good thing. Head sticks around along the rim of the beer. Probably one of the best smelling beers I've had, with this fantastic bourbon-vanilla-coffee aroma blend. Taste is a touch heavier on the coffee, with bit of booziness, but still very satisfying. Very glad I got a 4-pack. Looking forward to cellaring this one for a little while to see how it evolves.